There seems to be no moss growing under the feet of Corina Gertz, a globe trotting photographer/filmmaker/artist based in Dusseldorf, Germany! One look at her CV reveals her extensive worldly travels, and her stunning photographic images have been exhibited widely in Germany and throughout Europe, as well as China, India, Uzbekistan and Singapore. In addition to her gorgeous photographs, she has also directed and produced several documentary films that have premiered at the Dusseldorf Film Museum. She has lived in Florence, Italy, Capetown, South Africa and Hong Kong (while creating collections for international clothing companies), and has taught at Universities in Beijing, Kunming Art Academy and University of Art in Wuhan, China. The artist residencies she has attended have been in India, Russia, Ireland, Thailand, China and Spain. Intrigued yet?! Hello Corina, thank you for taking the time to share your story with us! I’ve been following you and your work since I first heard about you at the artist residency Sanskriti Kendra in New Delhi, India. I had arrived a few months after you left and your name was mentioned by the host because we both are clothing designers as well as artists. Thanks, Amy. Sanskriti Kendra was my very first residency I attended. I am still in contact with artists who stayed there at the same time, and we visit each other occasionally. The host later told me about you too, which made me follow your reviews about residencies. By doing so, I learned about Cill Rialaig (in Ireland), and I applied because of your recommendation and photographs of this magical place. I’m so glad you were inspired to go there! Let’s talk a bit about your background. I understand you are from Dusseldorf, Germany, and are currently based there. When did you develop a love of travel and why? I was born and raised in Wuppertal which is about 40 km away from Düsseldorf. In the 18th and 19th centuries, the Wupper valley was one of the largest industrial regions of continental Europe. It was the major industrial centre for textiles. My father and grandfather have been in the textile business. My father's dream was that I would take over his company. I have always refused this, because I couldn't imagine myself staying at the same spot for the rest of my life. Did you get a degree in art, design, photography? Has that helped your career? I learned from the bottom up: first I learned couture tailoring before I studied pattern making and fashion design. During my studies I jobbed as a model, as a stylist for commercials, and as a photo assistant. This all was a solid base and connected various fields which are related to each other. That brought me to Florence where I designed for Roberto Cavalli after I had finished my degrees. Also later, when I was working in the clothing production companies in China and Taiwan, my knowledge of pattern-making and tailoring was a benefit. Do you still design clothing? And do you do other things that support your art/photography career? I do not work as a fashion designer anymore. But I give lectures and I write fashion-philosophical essays. My focus has shifted into art and photography, which gives me a greater freedom. Here I work mainly on my portrait series of traditional costumes. Furthermore I work on several curatorial projects. 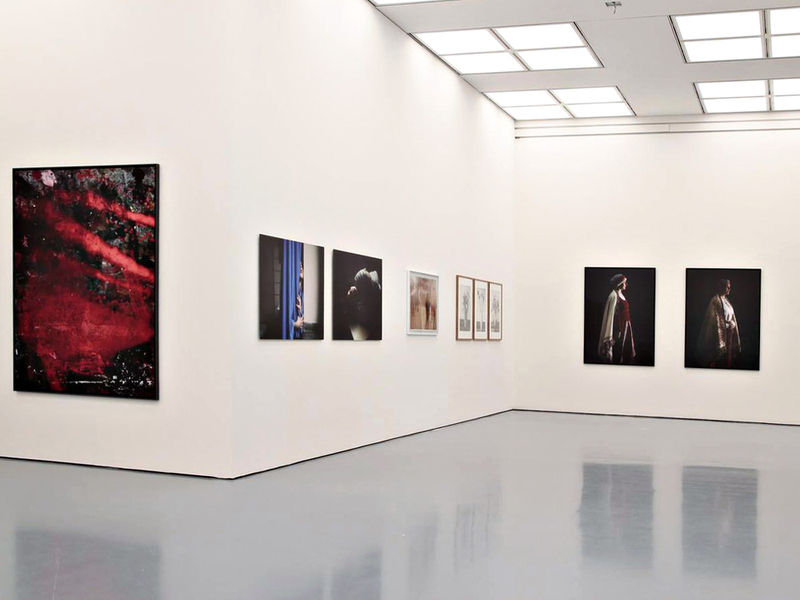 E. g. I was assistant to the curator for the vast exhibition Bauhaus and Photography – New Vision in Contemporary Art which is currently on show at NRW-Forum Düsseldorf and will later on travel to Berlin and Darmstadt. Here I was also responsible for the catalogue. This year I will curate the exhibition Très Chic – Mode in der Kunst at Kunstverein Ludwigsburg which shows work by artists of all fields that deal with fashion and textiles in one way or the other. Corina at her exhibit in China. Your photographs celebrate the rich local traditional costumes from different parts of the world - China, India, the Matadors of Spain, Latvia, etc. How did you begin to develop these projects. While I was living in southern Africa I got to know the nomadic tribe of the Himba, which lives in the Kaokoveld in Northern Namibia on the boarder to Angola. At that time these people still lived in a very traditional way and were relatively untouched by the western civilization. The various clothes, hair styles and jewelry of the Himba’s, have certain meanings and give you an exact information about the social position and the personal situation. This pure form of fashion as an instrument of communication, which does almost not exist anymore in the western world, was what drew my interest as a fashion designer and photographer. So I lived with the Himba tribe for several months, and studied their rites and clothing customs and made photo documentations. It took many days to get to the Himbas, the Kaokoveld was only accessible by a 4x4 which was equipped with a roof tend, food, and cans of drinking water and petrol. Later, when I did a photo project in the Amazon, we slept in hammocks for weeks and lived on piranhas which we fished from the river. At night I was eaten up by mosquitos. All was very basic and rough, but I enjoyed the freedom. Those were wild and adventurous times which I don't want to miss. Many of your photos show the subject from behind - called the Averted Portraits - tell us more about why you choose to show them in that way? When I started my photographic work about clothing rites, the images were quite different to how they are today. They showed tribes in their daily life. The photographs looked more like photo journalism which you find in magazines. This was not my intention. So I started photographing the people in front of a black background. I realized that looking in a person's face, the observer becomes distracted and starts judging right away: is the portrayed person young or old, pretty or not, etc? Photographing the subject from behind puts the picture onto another level; it becomes almost sculptural, and the observer can focus on the details of craftsmanship. This rigor gives the series its power, I think. Your photos are quite large and luscious - what sort of camera do you use, and is there much done in the editing process? Those averted portraits are printed 88 x 66 cm which shows the person in actual life-size. It depends on the situation which camera I use, because camera equipment is heavy. Sometimes it gets absurd when I travel: tripod, laptop, cameras, background, hard drives. Some pictures I took with a 5D Mark II, others I took with a Phase One. It depends on how flexible I need to be. But I try to keep the editing as little as possible. Teaching seems to be another way that you travel, by lecturing in such countries as China and Latvia. How did that come about? I have been invited to be part of various delegations of experts in the art fields to give lectures and workshops at the Latvian Art Academy in Riga, and Universities and Art Academies all over China. Sometimes I get invited to join panel discussions or take part in juries for fashion awards. I enjoy working with young students and help them to structure their ideas, as it keeps me open and awake to all kind of new things. It is great to see their passion which often reminds me of my own student times. Corina with some of her Chinese students. I’m also intrigued about your documentaries that you directed and produced. Can you tell us more? I live in the unique Golzheim Artists' Colony in Düsseldorf which is part of the studio support program of the City of Düsseldorf. In 2013, the 60-minutes documentary film Island along the Rhine - The Golzheim Artists' Colony was released and had its premier at the Düsseldorf Film Museum. I received great support by professional people who joined the team like the historian Dr. Stefanie Schäfers, the film maker Christoph von Chamier who started this film project together with me, and Gudrun Teich who did a great job by editing it. The film portrays the artists who live and work in this colony and visually captures their studios. It also shows brief historical reviews, from 1937 when it was built until today. 2014 the documentary film ORGANHAUS – Art between Yangtze and Rhine had its premiere at the Düsseldorf Film Museum. It is about the Organhaus in Chongqing, China, an independent artist institution, and its artists' exchange with the City of Düsseldorf. Both documentaries have been screened internationally with English and Chinese subtitles. 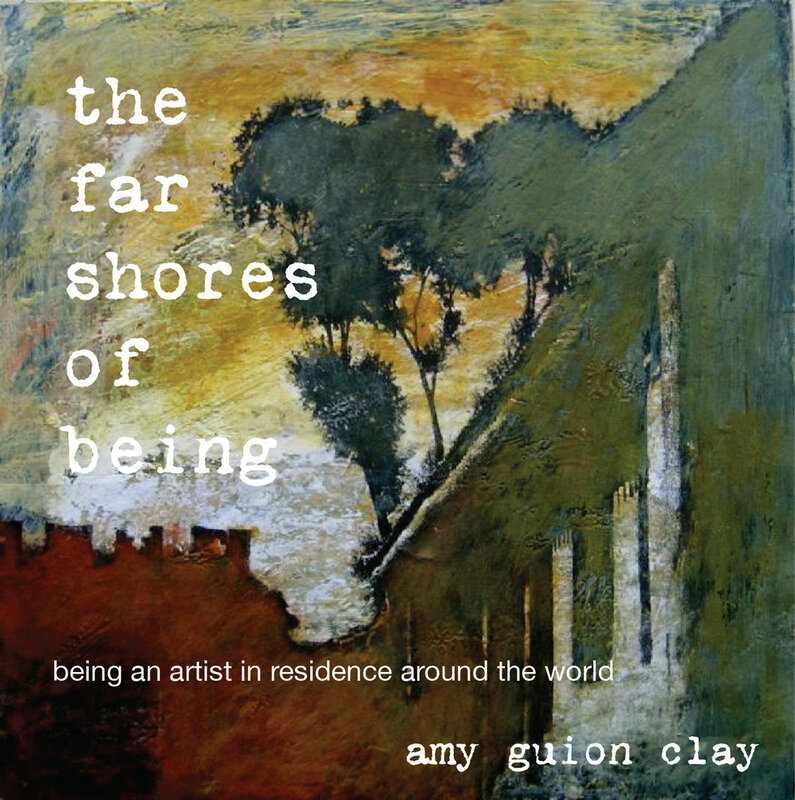 You also have been to many artist residencies - in Thailand, China, and a few that I have been to also: Cill Rialaig in Ireland and Fundacion Valparaiso in southern Spain. What have been some of your favorite residencies, and what kind of projects have you worked on there? Artist residencies have been very helpful to me in many ways. I contacted their staff in advance and explained clearly what I was planning to do and asked them for their support to get in contact with certain people and organizations, and to organize permissions for me. In Rajasthan I was able to camp in a remote village for 2 weeks which helped me to get in contact with the villagers very closely. At Fundacion Valparaiso (Spain) I sorted the entire film material of Island along the Rhine every day for 5 weeks, wrote down each word that was said in front of the cameras, and decided what had to be in the film, what maybe could be in the film, and what would definitely be thrown out. The residency provided breakfast, lunch and dinner, took care of washing and cleaning so I was able to concentrate on structuring the documentary and build story boards on the wall. Along the way, the residency’s secretary organized an appointment with some famous matadors who I portrayed. Valparaiso is close by the sea, so we could go for a swim when stuck in our thoughts. In the morning some of the 8 artists and writers gathered for yoga on the roof terrace before we all started working on our projects; in the night we met for food and wine and fought about art and other things. Anything else you’d like to share with our readers about your art and travels? What I enjoy most about my art and travels is that it gives me the feeling of freedom. I am very lucky to have gained deep friendships around the globe and to experience different forms of mentalities and thinking. This keeps me flexible and open-minded. I make myself feel at home wherever I am, and I am very thankful to be able to live my life like this. Thanks, Amy, for this interview, and hearty virtual hugs. I hope our path will cross someday somewhere on this beautiful planet.